Grilled cheese is a serious business in New York City. From food trucks pressing bread and cheese on the go to a recently opened shop with a grilled cheese-only menu, New Yorker’s are declaring their favorite cheesy comfort sandwiches. 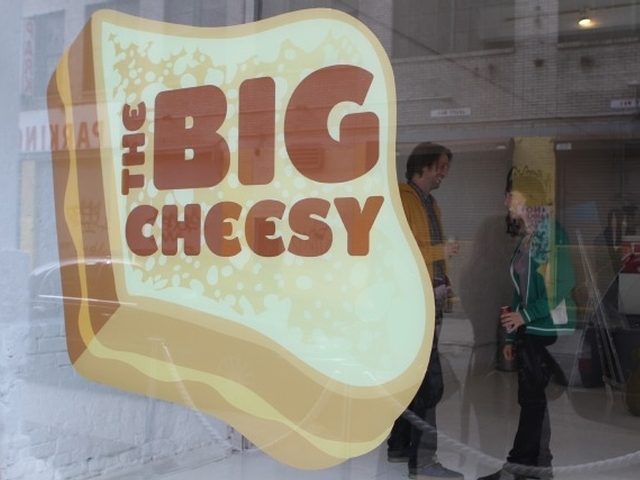 Next weekend, Openhouse Gallery is hosting The Big Cheesy, a two-day grilled cheese pop up to declare the best sandwich in the city and celebrate creative takes and tastes on this childhood classic. Participating in the celebration are Murray’s, Big Daddy’s, Casellula, Little Muenster, Lucy’s Whey, Melt Shop and Tartinery. They’ll be making seven exquisite types of grilled cheese to pair with a 16 oz. tallboy of Sixpoint Sweet Action, Righteous Ale, Crisp Pilsner or Bengali Tiger IPA. Bringing you kid sister? She can sip on Bella Lula to wash down her creamy sandwich tastings. Guests will get one vote to leave at their favorite table. The winning chefs will get a half-page ad in Edible Manhattan, a certificate and the crown of best sandwich in the city. To purchase tickets and reserve a time slot, go to Time Out New York Offers & Experiences. For the story on last year’s participants and photos of creamy, gooey goodness, check out my adventure at The Big Cheesy 2011.